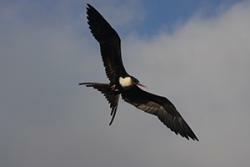 An adult Frigatebird. : ©Aurélien Prudor CNRSSome animals live life at the extremes and can provide insights into how the natural environment and atmospheric conditions have influenced and shaped their wing and body shape and behaviour. Frigatebirds (closely related to the cormorants and gannets) are unusual in that they have the largest relative wing area (or lowest body mass wing loading) of any bird species. This gives them an exceptionally buoyant flight and efficient ability to soar and glide. In addition, they live for over 40 years, do not breed for the first 8 to 10 years, and exhibit the longest chick-rearing period among birds (up to 6 months), with additional post-fledging care. This is related to their difficult predatory lifestyle that involves spending weeks at a time at sea, catching flying fish or sometimes harassing other seabirds until they provide it with food (kleptoparasitism). Curiously, despite their life at sea, these birds do not oil their feathers to keep them waterproof and so, as a result, they never rest on the ocean surface and must stay permanently airborne, even at night. With such a suite of specialised attributes, there is great interest in how the birds were able to stay at sea for so long and how they cope with the changing wind conditions and long-distance movements. An international team of scientists, led by Professor Henri Weimerskirch of Chize Centre for Biological Sciences, CNRS in France, with collaboration from Dr. Charles Bishop, Bangor University in the UK, studied the movement ecology of great frigatebirds (Fregata minor). The frigatebirds were tagged on the Island of Europa with GPS trackers to monitor their flight movements across the Indian Ocean including altitude changes, with additional data loggers used to measure heart rates, body accelerations and wingbeat frequency. The new study (published in Science 1st July 2016) shows how juvenile and adult frigatebirds use atmospheric weather conditions to circumnavigate the entire Indian Ocean at low energetic cost, by riding the trade winds that circle around the central equatorial doldrums. A juvenile frigatebird: ©Aurélien Prudor CNRSBoth juvenile and mature frigatebirds spend weeks at a time continuously on the wing while foraging for flying fish and squid, and use updrafts under cumulus clouds, located around the edge of the doldrums, to spiral efficiently upwards to heights of 600 to 4000 meters, rather like vultures, before gently gliding back down over many tens of kilometers. “The result is a rather roller-coaster pattern of ascent and descent, in which 75% of the time there are no or rare wing beats”, said Professor Henri Weimerskirch. Not only are most of the climbs done with little flapping of the wings but also with very low heart rates. While at sea for weeks at a time, average heart rates were only 203 beats per minutes. Dr. Charles Bishop said: “The maximum heart rate of frigatebirds is around 500 bpm, compared with humans at 200 bpm, so that these birds are only at the human equivalent of a slow walking pace on these long journeys”. The birds favour heights of between 50m and 600m where the winds conditions are optimal for achieving these flights at very low energetic costs, with steady horizontal trade winds and additional updrafts under occasional cumulus cloud patches. Climbs up to the base of the clouds is quite slow but occasional climbs above this height are much faster (4-5 m per second) as the birds are caught up in the faster rising air inside the clouds themselves. Professor Weimerskirch said: “At heights of almost 4000 meters the air temperatures can drop to below freezing, even in the tropics, but the benefit of using the energy in the enviroment to enable such low cost flight patterns must outweight the physiological thermoregulatory costs”. Birds only spent around 10% of their time near sea-level, so they had surprisingly few opportunities to hunt for flying fish and squid, or to chase other birds for food. These sea-level periods were typified by near continuous periods of flapping and heart rates over 400 bpm. 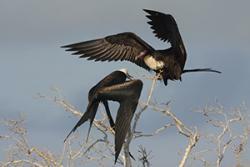 A frigatebird feeding event: ©Aurélien Prudor CNRS“The high level of skill required to catch prey without touching the sea or by forcing other species of birds to release their own food, coupled with learning how to circumnavigate the oceans, may explain why this species does not attempt to breed until at least 8 years old”, said Dr. Bishop. The local roller-coaster flight pattern depends on taking advantage of the rather random distribution of cumulus clouds. On a larger scale, the birds follow the easterly northern trade winds to travel from Africa towards Indonesia and then cross over to the South to catch the westerly trade wind to enable the return flight via a giant circle. In the middle of the ocean, is the generally calm equatorial centre typified by the warm slowly rising air of the doldrums, whose moist air eventually moves North and South at high altitude, before cooling on descent to drive the tradewinds themselves. These results raise many questions, not least about the ability of these birds to sleep during the many days in flight, but also how they negotiate tropical storms and what the future will hold for them as the climate becomes warmer and more variable. 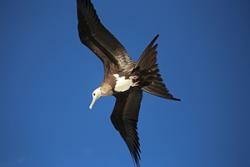 Article: Frigate birds track atmospheric conditions over months-long trans-oceanic flights, by Henri Weimerskirch et al. (2016) Science, 1st July.